In the Spirit of Martin : : the Living Legacy of Dr. Martin Luther King, Jr.
"Essays and poetry by Nikki Giovanni, Dr. Walter Leonard, Gretchen Sullivan Sorin, Helen M. Shannon, Julius Lester, Congressman John Lewis, Donzaleigh Abernathy, Stanley Crouch, Gwendolyn Brooks"--Jacket. "This book was developed and produced by Verve Editions, Burlington, Vermont ... c2001"--Colophon. "Published on the occasion of the traveling exhibition "In the Spirit of Martin: The Living Legacy of Dr. Martin Luther King, Jr.," created and developed by Gary Chassman, Verve Editions, and organized for travel by the Smithsonian Institution Traveling Exhibition Service in cooperation with the Martin Luther King, Jr. Center for Nonviolent Social Change"--Colophon. 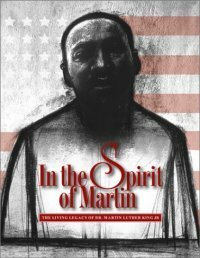 In the spirit of Martin / Nikki Giovanni -- Martin Luther King, Jr. : the man and his mission / Dr. Walter J. Leonard -- Martin Luther King, Jr. and the enduring struggle for freedom / Gretchen Sullivan Sorin -- Watching history-making in the making : artists on Dr. Martin Luther King, Jr. and the civil rights movement / Helen M. Shannon -- "We as a people will get to the promised land" -- Martin Luther King, Jr. and the beloved community / John Lewis -- The vision of the beloved community -- A man made real by sound / Stanley Crouch -- "The alternative to violence is non-violent resistance" -- Freedom songs and singing : the unbreakable bond between African American songs and struggle / Bernice Johnson Reagon -- "Injustice anywhere is a threat to justice everywhere" -- Judged not by the color of his skin / Donzaleigh Abernathy -- An American hero -- The courage of idealism / Julius Lester -- "I may not get there with you" -- "I have seen the promised land" -- Update on Martin Luther King, Jr., and the best of my heart / June Jordan -- The legacy of Martin Luther King, Jr. -- Martin Luther King, Jr. / Gwendolyn Brooks -- A glossary of people, places, and events -- Artist biographies. Atlanta, Ga. : Tinwood Books, ©2001. Description: 223 pages : chiefly illustrations (some color) ; 31 cm. King, Martin Luther, -- Jr., -- 1929-1968 -- Influence. King, Martin Luther, -- Jr., -- 1929-1968 -- Pictorial works. King, Martin Luther, -- Jr., -- 1929-1968 -- (OCoLC)fst00040023. Civil rights movements in art. African Americans -- Civil rights. -- (OCoLC)fst00799575. Civil rights movements. -- (OCoLC)fst00862708. Civil rights movements in art. -- (OCoLC)fst00862719. Influence (Literary, artistic, etc.) -- (OCoLC)fst00972484.